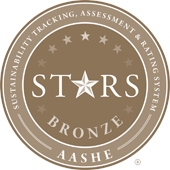 In an effort to promote more sustainable practices and track our progress, the University of the District of Columbia registered as a Charter Participant of the Sustainability Tracking, Assessment and Rating System (STARS). STARS is a transparent, comprehensive self-reporting framework developed for colleges and universities to measure their sustainability performance and make key indicators publicly visible. UDC’s STARS rating represents the combined efforts of students, faculty, and staff in numerous divisions, colleges, and departments across the institution. The UDC Sustainability Initiative wants to thank all of the individuals that contributed to the reporting effort. To view our STARS submission, please click here.